“Egypt’s Cultural Role in the Eyes of Bibliotheca Alexandrina”, a Talk by Excellency Dr Mostafa El Feki, Director of Bibliotheca Alexandrina. 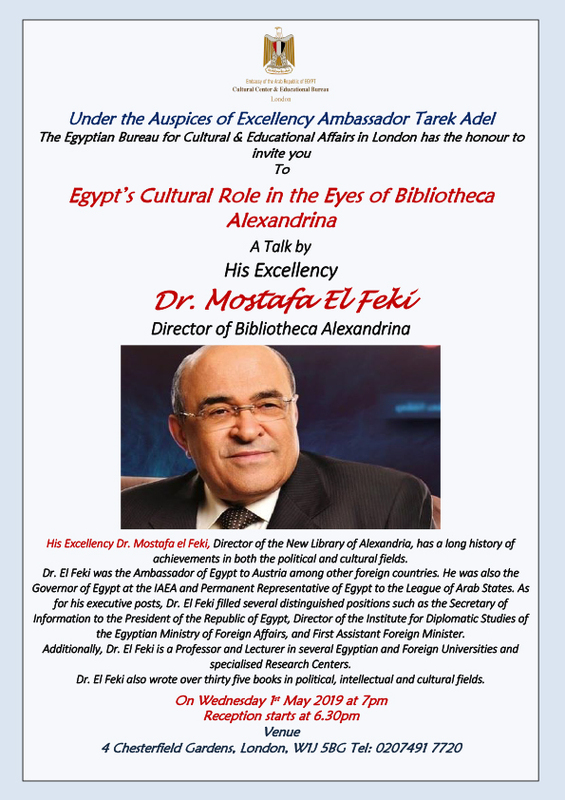 Under the Auspices of Excellency Ambassador Tarek Adel The Egyptian Bureau for Cultural & Educational Affairs in London has the honour to invite you To Egypt’s Cultural Role in the Eyes of Bibliotheca Alexandrina A Talk by His Excellency Dr. Mostafa El Feki Director of Bibliotheca Alexandrina. His Excellency Dr. Mostafa el Feki, Director of the New Library of Alexandria, has a long history of achievements in both the political and cultural fields. Dr. El Feki was the Ambassador of Egypt to Austria among other foreign countries. He was also the Governor of Egypt at the IAEA and Permanent Representative of Egypt to the League of Arab States. As for his executive posts, Dr. El Feki filled several distinguished positions such as the Secretary of Information to the President of the Republic of Egypt, Director of the Institute for Diplomatic Studies of the Egyptian Ministry of Foreign Affairs, and First Assistant Foreign Minister. Additionally, Dr. El Feki is a Professor and Lecturer in several Egyptian and Foreign Universities and specialised Research Centers. Dr. El Feki also wrote over thirty five books in political, intellectual and cultural fields.